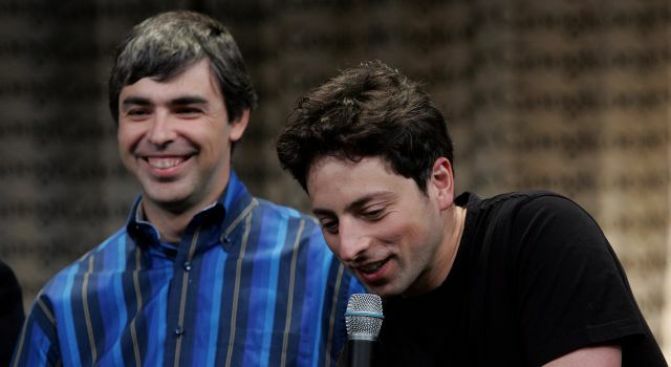 Google founders Larry Page and Sergey Brin are taking on Microsoft with a new operating system. SUN VALLEY, Idaho - Google is working on a new operating system for inexpensive computers in a daring attempt to wrest away Microsoft's long-running control over people's computing experience. The new operating system, announced late Tuesday night on Google's Web site, will be based on the company's nine-month-old Web browser, Chrome. Google intends to rely on help from the community of open-source programmers to develop the Chrome operating system, which is expected to begin running computers in the second half of 2010. The Mountain View, Calif.-based company disclosed its plans for the operating system shortly after an online technology news service, Ars Technica, and The New York Times telegraphed the news on their Web sites. Google is designing the operating system primarily for "netbooks," a lower-cost, less powerful breed of laptop computers that is becoming increasingly popular among budget-conscious consumers primarily interested in surfing the Web. The operating system represents Google's boldest challenge yet to its biggest nemesis — Microsoft. A high-stakes duel between the two technology powerhouses has been steadily escalating in recent years as Google's dominance of the Internet's lucrative search market has given it the means to threaten Microsoft in ways that few other companies can. Google already has rankled Microsoft by luring away some of its top employees and developing an online suite of computer programs that provide an alternative to Microsoft's top-selling word processing, spreadsheet and calendar applications. Meanwhile, Microsoft has been trying to thwart Google by investing billions of dollars to improve its own Internet search and advertising systems — to little avail so far. In the past month or so, though, Microsoft has been winning positive reviews and picking up more users with the latest upgrade to its search engine, now called "Bing." Microsoft is hailing the makeover with a $100 million marketing campaign. Now Google is aiming for Microsoft's financial jugular with Chrome its operating system. Microsoft has drawn much of its power — and profits — from the Windows operating system that has steered most personal computers for the past two decades. Google's chief executive, Eric Schmidt, and its co-founders, Larry Page and Sergey Brin, have made little attempt to conceal their disdain for Windows in recent years. Schmidt maintains Microsoft sometimes unfairly rigs its operating system to limit consumer choices — something that Microsoft has consistently denied doing. Google fears Microsoft could limit access to its search engine and other products if Windows is set up to favor Microsoft products in the default settings. Page and Brin have frequently derided Windows as a clunky operating system susceptible to computer viruses and other security problems. Google made a veiled reference to Windows' perceived shortcomings in its blog posting. "We hear a lot from our users and their message is clear — computers need to get better," wrote Sundar Pichai, Google's vice president of product management and Linus Upson, Google's engineering director. A Microsoft spokesman didn't immediately respond to an e-mail request for comment sent early Wednesday morning. Schmidt and Brin are expected to discuss Google's new operating system later this week when they appear at a media conference hosted by Allen & Co. at the Sun Valley resort in Idaho. Despite its own power and prominence, Google won't have an easy time changing the status quo that has governed the personal computing industry for so long. As an example of how difficult it is to topple a long-established market leader, Google estimates about 30 million people are now using its Chrome browser — a fraction of those that rely on Microsoft's market-leading Internet Explorer. And there have been various attempts to develop open-source software to undermine Microsoft with relatively little effect. The Chrome operating system will run in a new windowing system on top of a Linux kernel — computer coding that has been the foundation for the open-source software movement for nearly two decades. Google has already introduced an operating system for mobile devices, called Android, that vies against various other systems, including ones made by Microsoft and Apple Inc. The Android system worked well enough to entice some computer makers to begin developing netbooks that will eventually run on it. Google, though, apparently believes a Chrome-based system will be better suited for running applications in netbooks. "We believe choice will drive innovation for the benefit of everyone, including Google," wrote Pichai and Upson.